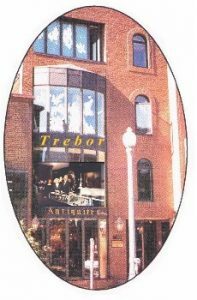 A Trebor’s Vintage Watches (vintagewatch.ca) offers an extensive collection of restored, used and vintage Swiss watches in good working condition for the watch collector and also for those who are nostalgic of the ‘good old days’ or want a watch like grandpa had. We specialize in mechanical automatic or manual wind watches, some by famous makers such as Omega, Longines, Le Coultre, as well as others by lesser known but equally interesting makers of fine quality watches. Visit our watch pages to see our fine timepieces. This was our store location in the 1990’s on Greene Ave in Montreal (Westmount) before moving to cyberspace. Vintage Omega watches have always been one of our favorites. We have been buying and selling old, antique and secondhand watches for over 25 years. We also deal in collectable vintage watches from many other makers including Breitling, Bulova, Cartier, Elgin, Gruen, Hamilton, International Watch Co., Le Coultre, Longines, Rolex, and many others. Feel free to ask any questions you may have about any of the items – we will be more than happy to provide you with additional information.